potentially costing $300,000 just in crane hire fees for the size of crane required to complete the work. To overcome this, H-E Parts presented a proposal to mobilize a crane onto a barge. This attracted the attention of the customer as it hadn’t been previously considered as an option. Based on H-E Parts comprehensive scope, feasibility and expertise, H-E Parts was awarded the project. There was a lot of pre-planning work needed to ensure that the crane lift was feasible and that it was safe. One factor to consider was that the crane becomes downrated by 30% when used on unstable ground, and without accurately knowing the weight of the old bin it presented an issue. 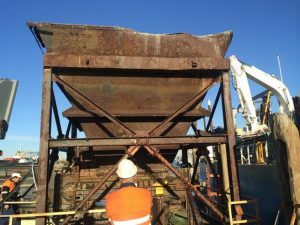 We then engaged a naval architect to check the stability of the barge and crane when fully loaded and to help prepare the lift plan. 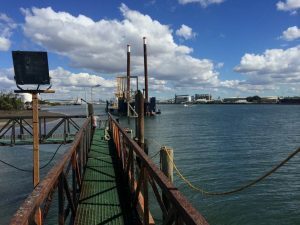 H-E Parts successfully completed the scope of work, which was to remove and replace with new – one sand bin and three aluminum gangways, totaling 55 meters in length. We mobilized a 250-ton crane onto a large dumb barge and towed it into position alongside the wharf using tugboats. All original equipment was removed from the site and disposed of and the project was completed on time and on budget. The methodology of using cranes and barges made the job quite unique and provided a cost-effective solution for the customer.